Put Your Comfort First With a New Hot Water Heater and Water Softener! Plumbing Isn’t Just About Your Fixtures and Pipes! We understand how you look forward to that hot shower at the end of a long day’s work. 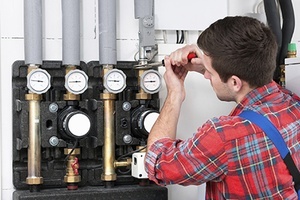 If your hot water heater or pump fails to deliver, you want it fixed fast! Here at Matlock Plumbing in Columbus, IN, we believe that your personal comfort is just as important as the structure of your home. Indulge yourself even further with the noticeable difference of a water softener. Just one day after installation, you’ll start to notice better tasting tap water, smoother skin, and shinier hair! Your pipes and appliances will last longer without need for repairs, and less need for expensive shampoos and lotions will save you money in the long run! It’s Time to Treat Yourself to a Hot, Soft-Water Bath! Matlock Plumbing provides complete shower and bathtub services in and around Seymour and Columbus, IN. As one of the most regularly used areas of your home, your shower and bathtub need to be in the best condition. Our plumbers can deliver the quality workmanship you need for your shower or bathtub. Whether your showerhead is malfunctioning or your bathtub won’t drain, Matlock Plumbing has the right solutions. We provide professional bathtub and shower repair services for your home. Our vans are always fully stocked with the necessary tools and equipment to provide fast and efficient plumbing repair services whenever necessary. If you are in need of bathtub or shower installation services, we are the professionals to call. We offer the latest tubs and showers from trusted brands that boast of the best of both worlds in quality and comfort. Whether you need new tubs and showers installed for new construction or remodeling projects, we can handle the job and offer you competitive rates. From tub and shower replacement to repair and installation, Matlock Plumbing has you covered. When it comes to plumbing services, let us be your first choice. Give us a call for a free estimate at 812-376-7992 in Columbus or 812-445-3491 in Seymour. We look forward to providing you with trusted plumbing services you can trust!